Ubuntu phone isn’t a whole new operating system, it’s not a new smartphone OS like Android, Windows Mobile, or iOS. 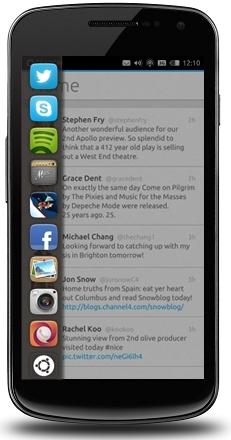 Ubuntu phone is a “smartphone interface” for Ubuntu. In other words while working like a phone, it has an Ubuntu phone layer that you’ll see… but if you dock the phone it’ll turn itself into a fully operational PC. 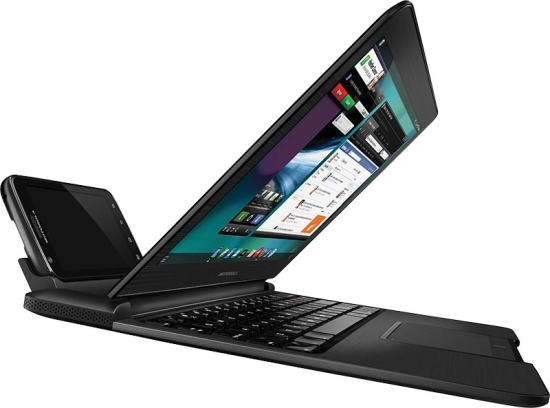 This isn’t the first foray Ubuntu has made in this direction with the Motorola Atrix. The Atrix was an Android powered device that you could shove into a netbook shell that contained no processor, memory, network hardware, or internal storage… the docked phone provided all of that. When plugged into it’s shell the Atrix ran a “Webtop” platform based on Ubuntu. It was an awesome idea but didn’t really take off and is no longer being made. Ubuntu phone intends to resolve the shortcomings of the Atrix and sidestep Android altogether. It’s just as founder Mark Shuttleworth promised ARS when he said Ubuntu will provide one operating system from phones to supercomputers, which sounds cool AND ambitious. The Ubuntu phone page for OEMs and Operators don’t list any partners yet, though there is a press conference later today where that may be announced, but they do show the requirements for running Ubuntu phone. Entry-level Ubuntu phones will require a 1Ghz Cortex A9 processor and between 512MB and 1GB of memory but won’t provide the full “desktop” experience. So that just the phone part of being Ubuntu phone. A high-end superphone, they dub as running a quad-core A9 or Intel Atom processor and at least 1GB RAM, will be able to double as a full blown PC. It looks like HTML5 will play a big role in Ubuntu phone apps, that said Ubuntu phone “doesn’t have the overhead of a Java virtual machine, so all core applications run at full native speeds with a small memory footprint.” So they’re sort of playing to the best of both worlds, and Ubuntu Software Centre will be beefed up to double as an app store for Ubuntu phone. A soon-to-be-released Ubuntu phone SDK is on it’s way that promises to make building apps that run seamlessly on both a desktop and a phone. This is likely to be something of interest for developers… write it once and it’ll run on anything that is powered by Ubuntu. It’ll be interesting to see if Ubuntu phone can make inroads on an already crowded mobile space. With quad core processors becoming the baseline going into 2013 our phones are certainly becoming powerful enough to be like a pc. The idea pf being able to undock an Ubuntu phone from my desk and take my entire computer with me. Check out the Industry Proposition video above and visit the Ubuntu phone site to read more.